Vizag is experiencing pleasant weather conditions with light drizzles and cool breeze. Its hard to resist the temptation of savoring hot off the stove snacks with a cup of masala chai. Handful of ingredients and a simple recipe come together into an incredibly magical monsoon snack. Placed oil in a kadai for deep frying. 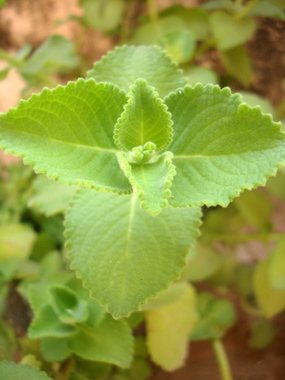 Went to the garden, plucked few fresh ajwain leaves aka Vaamu aakulu. Washed the leaves and left to drain. Prepared bajji batter using besan. 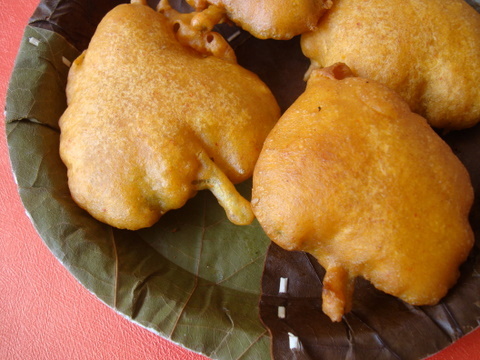 Dipped the aromatic vaamu aakulu in besan batter and deep fried them to golden brown. While the bajjis were frying, prepared masala chai. Everything came together is less than 15 minutes. 1 Combine both the flours with salt, soda, hing, chilli pwd and oil. Add little water and mix well that it forms a smooth thick batter. Do not add too much water. 2 Heat enough oil in a deep frying vessel. It should be piping hot. 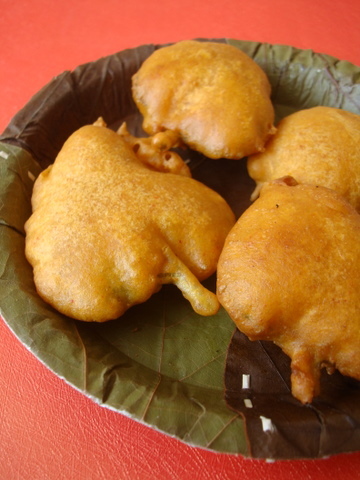 Dip each leaf into the besan batter such that it is well coated and place in the hot oil. Reduce heat to medium and deep fry till they turn golden brown. Use a ladle to turn them so that it cooks on both sides. Wowww awesome bajji, looks tempting..
how did grow this plant? I looked everywhere couldn’t find, how to grow them. is anyone of you live in BayArea,CA. I can come to your place and take some branches to grow. I live in India and not in US, Bhumika. Dear readers, any one growing this plant in Bay area, can you please help Bhumika? u can just throw some carom seeds in soil and u get the plant – as easy as that. Just mix up the soil lightly after planting the seeds and water regularly, in about a week u should see the sprouts. U can get Carom seeds in any indian store. I love most of your traditional andhra recipes. This recipe for vaamu aaku bajji, me and my mom tried few years back. But dont know were something went wrong. The leaves absorbed up a lot of oil, and we ended up with some really greasy bajjis. Taste was all fine, but then oil we couldn’t appreciate it. Is there a way to get rid of it? I know my mom would love to make em again, if something can be done. Unfortunately, bajjis absorb a lot of oil. Replace cooking soda with a tbsp of hot oil to the besan batter. Bajjis absorb less oil. Nanamma used to make these a lot!! so healthy!! Love these Bhajjis. My mom used to make them when we were small..haven’t made them in ages..
Vaamu Bajji looks very appetizing. I have a problem of getting “Vamu Aaku” in New York. I may have to use some alternate stiff edible leaf to to compensate for the “Vaamu Aaku” I will explore other alternatives. Thanks for the simple recipe. Keep writing great recipes! Best Wishes. Yesterday I was thinking of making these Bajji’s. What a coincidence. A month back planted Vamu plant and now it has so many leaves. Will make these Bajji’s this week. Thanks for sharing. 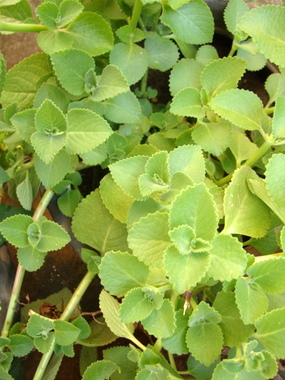 Ajwain leaves have healing property also. Shall make this for sure. do u let the carom plants flower & die, and plant them again ? As I want to know how long they live – 2 or 3 months ? No, I don’t let it die. It grows real fast so needs to be pruned often. They live long, for years. the leaves are hairy, do we have to clean this or scrub to remove the hairy layer please advise.